First off, the title of this post totally has me singing the Kriss Kross Jump song – you’ll think me later for sharing that link. Other than Criss-Cross, I couldn’t think of a better description for this wall though – besides of course amazingly-awesome-and-total-game-changer-for-my-dining-room. But that would have been a really long title. Now, in true “Jenna” fashion, I discovered how and how not to do this type of accent wall. I started out doing it one way and then ended up doing it another way. Either way, this criss-cross accent wall was truly a huge game changer for my dining room and does make me wanna jump-jump. Disclosure: This post is sponsored by FrogTape. However, all opinions, game-changing black and white accent walls, and references to Kriss Kross are 100% mine. This post contains affiliate links for your shopping convenience. Click here to read my full disclosure policy. Depending on what colors you want to use and how big your wall is, you can totally get by with $30 for creating this wall. Yes, $30 for one huge impact. Ok, I’ll quit referencing Kriss Kross songs now. Maybe. Paint color(s) of your choice – I used SnowFall by Behr (1 quart, give or take a little. I had extra left over from the bathroom) and Oxyx Black by Glidden (1 quart). If you are cool with the current paint color on your wall and just want to add in the criss-cross, leave your wall color as is and just choose a color for the criss-cross. If not, go ahead and paint your wall. I wanted the crisp black and white combo, so I painted the wall first with my paintstick and Snowfall by Behr. 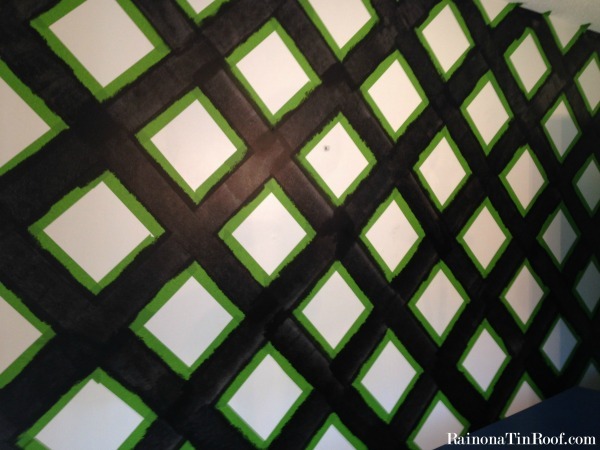 To make the criss-cross pattern, you are essentially creating squares that you will paint around. To start it off, take a piece of 12 x 12 cardboard or 12 x 12 scrapbook paper and place it in the top center of your wall turned sideways. Trace around the cardboard / paper. After you have traced it, place your FrogTape along your lines. You want the outside edge of your FrogTape to go right along the traced lines, therefore keeping your overall square 12 x 12, but making the white space within the tape smaller than that. Make sense? Just take your ruler and make tick marks, then put your tape along those marks and repeat. 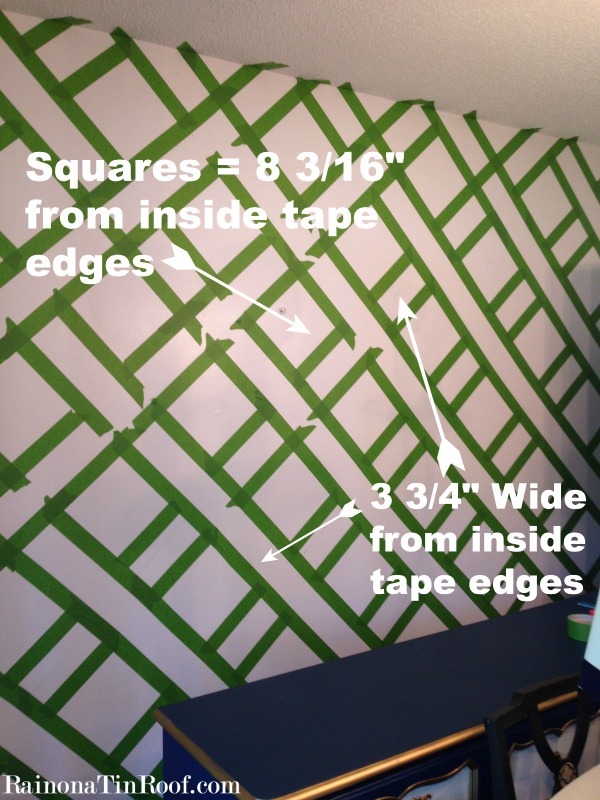 Once you have all your pattern taped out, you need to go back and even up your tape edges, so that you have perfect squares and can paint around them. I did this with an X-Acto knife and ruler. After your tape is squared up, take a credit card and use it to press firmly along the edges to seal the tape. After your final coat of paint, remove the tape. Ya know it makes ya wanna jump jump! Yea, I lied about the whole “I’ll stop referencing Kriss-Kross” thing. I’m sure it seems like this took forever to do. It actually really didn’t. Once you get in the hang of marking your measurements, it goes really fast. If you want to see the whole new dining room, you can tour it here. Need more accent wall ideas? I’m your girl! 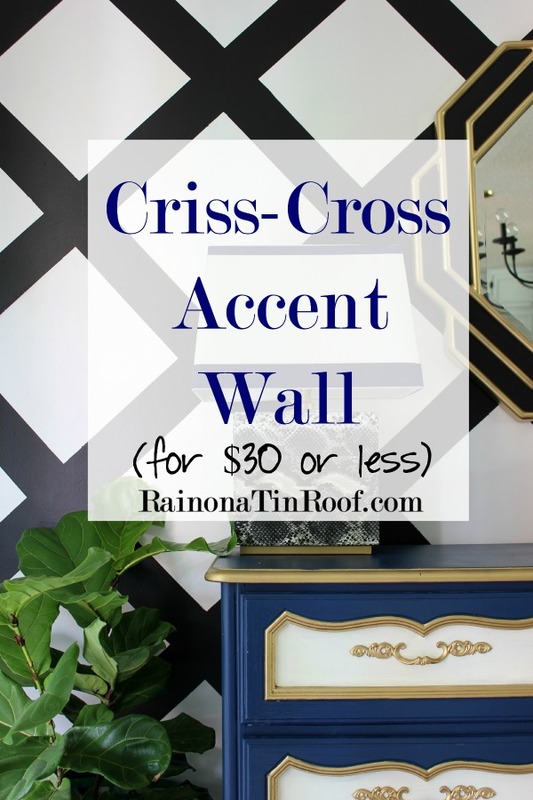 Cane Inspired Accent Wall for $25 or Less – a gorgeous wall that packs a big punch for not a lot of money! Black & White Gallery Wall – one of my favorite accent walls of all time, and an easy one to do! Easy Confetti Accent Wall – super easy and super fun accent wall! 9 Accent Walls for $30 or Less – on a tight budget? Check these out! There is always a good use for Frog tape! I love your idea of an accent wall and it turned out great. I am an exceptionally messy painter so I tape EVERYTHING! I find that I actually save time because I don’t have to worry about being meticulous about cutting in. My next painting project is my guest bathroom and there will be plenty of Frog tape involved. I know what you mean, Nicole! I can be messy too!! I’m sure your bathroom is going to be amazing! 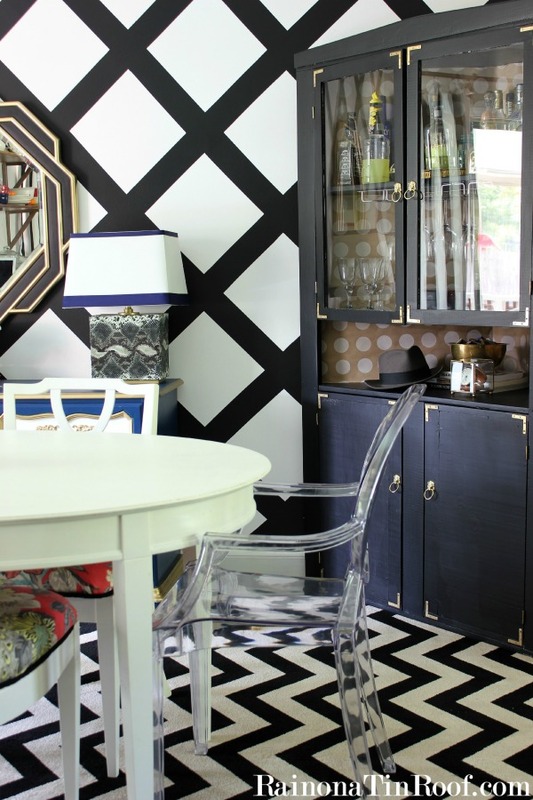 I just love the way the gold accents pop against the black-and-white criss-crosses! Also, those snake-skin lamps: be still, my beating heart! Girl, those snakeskin lamps were one of my best finds ever!! $10 for one and $5 for the other – they were Bargain Hunt finds!! And yes, I love some gold against black and white! Thank yoU! Since I’m a scaredy-cat – I would love to try a pattern paint on my laundry room cabinets. If that turned out okay – my laundry room would be my next big project. Stunning!! You did a great job–and such nice, crisp lines! I want to do some stripes for an accent wall in my dinning room! I’ve been dying to do something to the plain walls in my guest bathroom. I think this will be it!!!! Crossing my fingers. My basement walls are calling out to me! Something with lots of pattern and color. Soooo much love for this accent wall, Jenna. And you know I love a good cheap project so $30 is right up my alley! Your dining room looks AMAZING! Thanks, Chelsea!! I have a whole lotta love for it too! Oh I’m in love! I want to try a dresser top first. I’m dyslexic, sooooo, it will be a slow go until I get the brain to comprehend but I WILL get it. I’m excited to try. Your dining room looks beautiful and the feel of the room is perfect! Thank you, Hope! I love designs on dressers, tabletops, etc. – Yours will look fab! Wow, talk about a transformation! I’d love to attempt a herringbone pattern at the end of a small hallway. I have my fingers crossed and thanks so much for the opportunity! Ooooo, a herringbone pattern would be gorgeous, Susan! And I have not thought about Kriss Kross Applesauce in a long time!! My kiddo isn’t there yet, but I know it will come soon! Thank you! We just so happen to have a big, empty wall in our dining room. It is so empty that one of our kids looked at it the other day and commented how lonely our one little piece of art looked. I have been dreaming of doing something bold.different.fun in there. This would be fantastic to do! And any time there is a product available that will make my life easier, sign me up! If the kid says it needs something, it definitely needs something!!! haha!! Painting a few pieces of furniture. I am trying to figure out what I want to do with my daughter’s room. 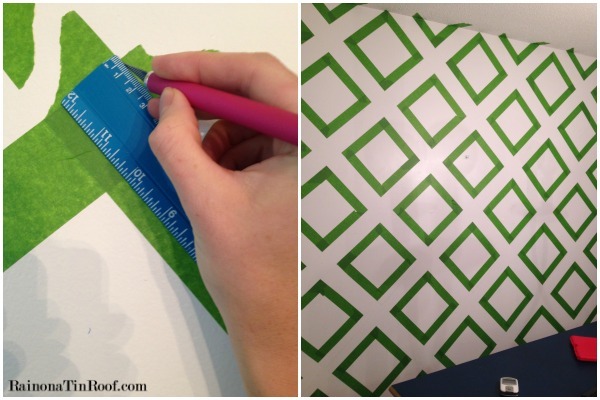 I think Chevron, but, no matter what I decide, I will use Frog Tape! I hate having to concentrate so hard on not making a mess, without tape! Game changer is right! I’m blown away by not only the change, but the whole design. 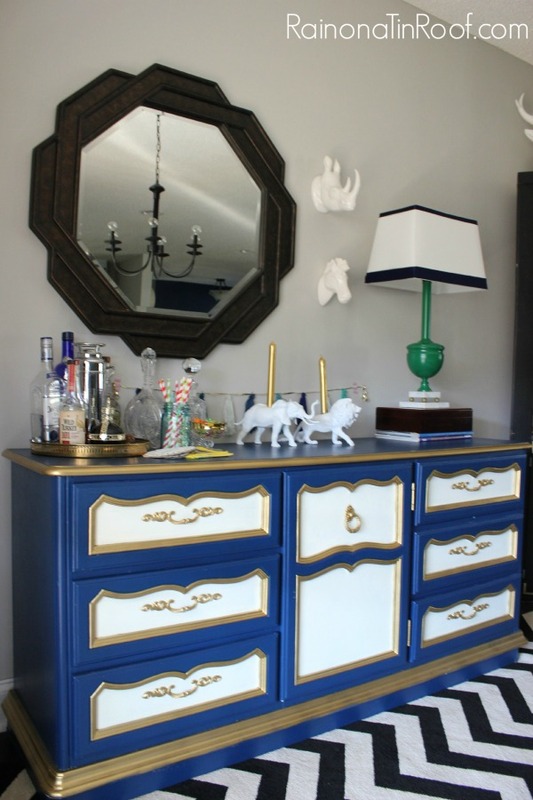 Painting gold accents on your mirror, the new lamps and bowl on books… that buffet! It looks incredible. Thanks, Sharon!! I already had the buffet done, but I just had too much stuff on it. The whole dining room had too much stuff going on – I did some serious editing and can’t believe how well it turned out! I LOVE black and white!! something about that high contrast makes me giddy!! I love the accent wall, it looks so amazing! Great Job! Same here, Kelly! Its just an awesome classic combo!! Thank you! Man, you must of exercised some patience with all that taping and math! The rock does rock, though!! Thanks, Selene! Once I got in the hang of it, it actually went pretty fast! Painting an old cabinet in the kitchen. Thanks for the giveaway! I would work on some furniture! Thanks, Jamie Lynn! Yes! Everyone needs an accent wall in their life! I think I will try this. You make it look easy enough, really good tutorial. Thanks Jenna you are a genius. Patty, once you get those measurements down and get in the hang of it, it goes really fast, I promise! I thought it would take so much longer, but was pleasantly surprised! You are gonna rock it! Love your dining room! 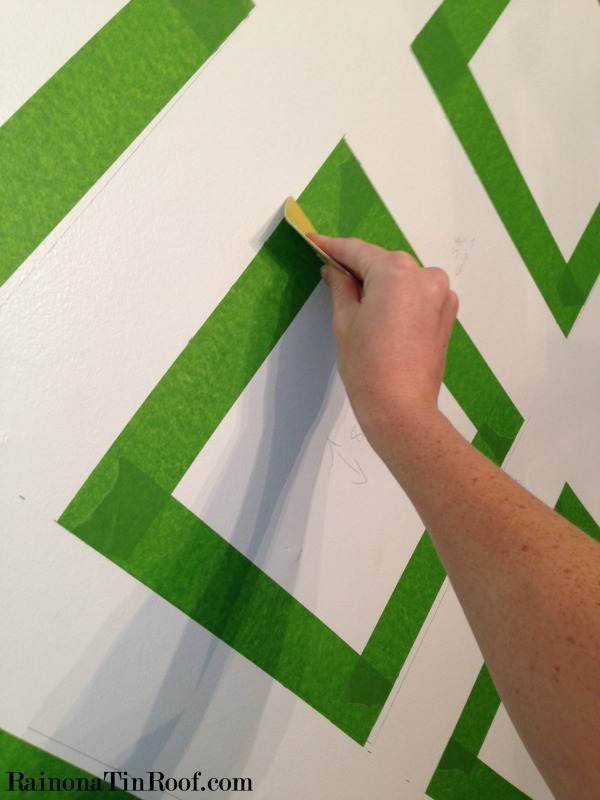 I just used frog tape in foyer…did horizontal stripes…frog tape is absolutely the BEST!!! Would never use any other kind. Planning on doing guest bathroom. Thank you, Gypie!! I love it too – it is really an awesome product! I am actually planning on doing some stripes in my hallway! Wow! What a huge impact but wow what a lot of work. It looks amazing! I love love this wall. Your dining room is stunning! I’m going to paint my guest bathroom soon and frog tape would come in so handy. Thanks for sharing your tips! The wall turned out amazing! The whole room looks gorgeous! Wow, love your new wall, it’s gorgeous! I would love to paint my endtables. Love the criss-cross pattern, I may do the same! We are in a new house and almost every room still needs to be painted. I need this to redo my vintage camper, Am told its the best!!! Love this! It is so bold and makes such a statement! I’d definitely love to try something like this, but seeing as I live in a rental, I’ll have to stick with painting projects that can come with me when I move! Thanks, Kristina! I totally understand about the rental! I’m desperate to try Frog tape. Tried the rest now I’ll try the best! Many projects planned, can’t wait. 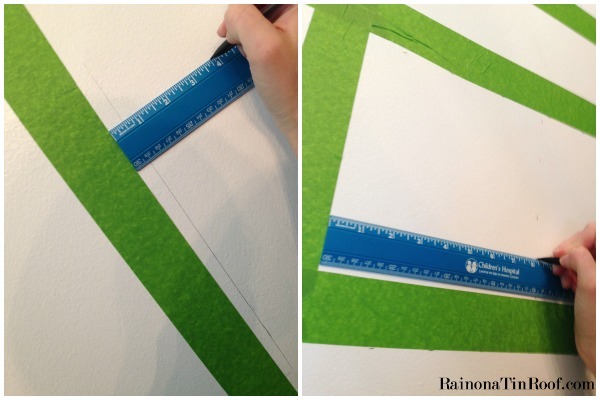 I want to use this method to paint a white lattice on a green wall. Now you have me singing that song in my head! Love what you did with your wall, it looks awesome! Goal achieved, Charisse! haha! Thank you! I have just the wall to use this pattern on. I hope it looks like yours! I need Frog Tape for my bathroom paint job. I want to repaint the cabinetry and walls. I am in LOVE with this cris cross, not wait, the mirror, no wait the blue chest…well what the heck…I love them all individually and together…great taste, wonderful idea and fantastic result. I would want to do that on my powder room ceiling i guess. Thankyou for the tutorial / idea. Thank you, Vidhya! I love all of those pieces and elements too! Putting this pattern on a ceiling is an AMAZING idea!! This wall looks amazing! It’s awesome how much you can change a wall with some painters tape and paint. Great job! Thanks, Christie! I know – so crazy how a little tape and paint go a long way! Oh my god, I don’t know how the hell you did that!! My eyes hurt. You can come over and do that in my home. Your tut is awesome though. And I would only use Frog Tape too. It was so much easier than it looks, Jamie! Thanks! I have some painting projects coming up soon and would love to use Frog tape. Love your criss cross! This wall is seriously A.MAZ.ING. I am so in love with it!! I just LOVE your blog! You inspire me! I recently attempted a chevron pattern with blue painters tape, but the tape barely stuck and the project was a disaster. I tend to shove those dud projects aside, but I really need to fix it and try again. So I guess I’ll have to buck up and buy the Frog Tape, since it clearly works great! I’m also afraid Ill cut too deep with the E-Acto knife. Can you offer any tips or tricks to keep from gauging my projects? Thanks again for the inspiration!! Thanks so much, Kristina!! I live for comments like that! First off, I have tried the FrogTape Chevron pattern tape and it worked amazingly well! Loved it! On the X-Acto knife, multiple light cuts are the way to go to avoid deep cuts. However, if you get a small deeper cut every once in a while, they are usually not noticeable after its painted. Hope that helps! OH my goodness, this would be perfect for the accent wall in my office!!! Stripes in my foyer or my son’s bedroom. I am currently making LOTS of wooden signs. This would be perfect for stenciling background designs onto them!! I’ve been thinking about a “picket fence” on my accent wall in the kitchen. The background color is already painted—-just need the pickets! Thank you!! I love the added drama too! Thanks, Ariel! This is one of my favorite accent walls I’ve done! Wow! Such a bold statement. LOVE it! Thanks for sharing with us at Share the Wealth Sundays! Wow, what a gorgeous and bold wall. I love how it turned out and you did a great job. Thank you for sharing at Dishing it and Digging it link party. What a great way to spruce up plain walls, I can see this in my bedroom with the help of my son!! So effective yet stylish. Thanks for sharing with us at #OvertheMoon link party. Oh, love your accent wall. I’d love to do this to a room. Thanks for sharing your DIY at the #InspirationSpotlight party. Pinned & shared. Thanks so much! We loved this wall! Wow! 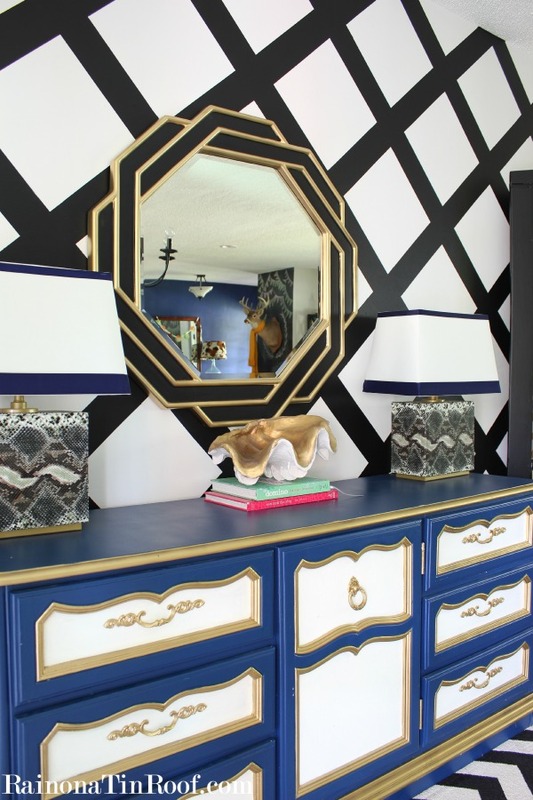 What a focal point, all your hard work taping up the pattern paid off! Love this wall! Thanks for linking up with Funtastic Friday! Thanks so much, Heidi! One of my favorite walls! That turned out very impressive! Thanks for sharing at What’d You Do This Weekend? Hope to see you again next week!